Can you believe that I'm already thinking about Christmas? As Wagtail's event coordinator, I'm always thinking ahead. Seems like I just put away my Christmas decorations, and here I am ordering things! You might know Lisel Miller. She owns the Sugar Maple Inn with her granddaughter Holly. Lisel grew up in Germany where they have Christkindl Markets. They're so charming! This year we're going to line the green with Christkindl booths. I bet it will bring a lot of Christmas shoppers and become a tradition. There's quite a bit of pressure on me to make it successful. Did you hear about Animal Attraction, our matchmaking event? Financially we did quite well. The merchants loved it! Wagtail was packed with visitors. Just between us, who knew there were so many people out there looking for love? The dogs and cats even got involved. But there was a slight hiccup (okay, a major disaster), when someone was murdered! And as the brainchild behind the event, I took some heat for that. So it's doubly important to me that the Wagtail Christkindl Market be successful. Have you ever been to a Christkindl Market? There are some wonderful ones in the United States. Shh. Here's a sneak preview of the cover! 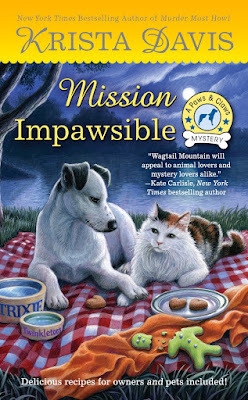 Just in case you missed Mission Impawsible, Krista says I can give away two copies! Leave a comment with your name and email address so she'll know where to find you if you win. I love the titles and would love to read one. Thanks for the chance. Your new Cover is charming. I would love to go to one of those Christkindl Events. Thank you for the review and Contest. Love animals and the cover of both books. This series is new to me and would love to read the first book. mlarkin at rmrgroup dot com. thanks for the opportunity. Oh my goodness, I love the new cover! It's so sweet! If the pup was a yellow lab, that could be our fur babies. hahaha! Thanks for the chance to win too! Those titles are so much fun! Your New cover is beautiful. I was fortunate enough to read Mission Impawsable, and it was WONDERFUL. The books covers are wonderful I would love to read these books, thanks for the chance to win. I would love to read "Mission Impawasible". Love this series. 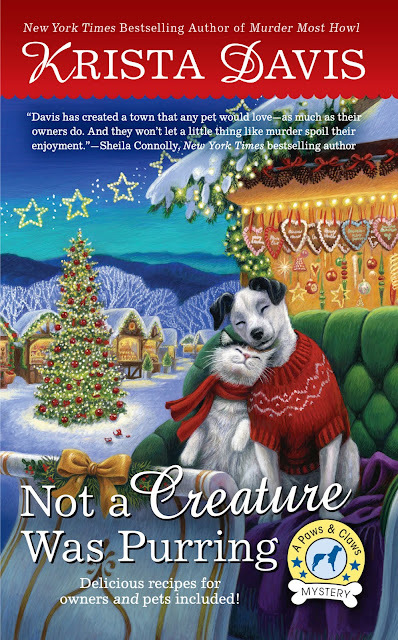 Love the cover of "Not a Creature Was Purring". Sounds like a great holiday read. I love the cover!! It's just so appealing. Must read the next installment. I love it you share early!!!!!!!!!! No need to enter, just am so excited about the new book, the cover reveal and to learn there will be a Christkindl Market!! Wahoooo!! Love all of the books in this series. My favorite hands down! I sure do love Krista's books! bobwiesmann at gmail dot com. Absolutely love this series. Wish it were a real place....oh the fun we could have!! That new cover is the best one yet! It's just like by dogs and cats look together. Hi! I've never read any of Krista's books and would love to give one of them a try. They sound great. I would love to read Mission Impawsible. The cover on your Christmas book is too cute. Christmas and animals in sweaters! Can't get anymore adorable than that! Would love to receive a copy of this book!